Benjamin Isitt, From Victoria to Vladivostok: Canada’s Siberian Expedition, 1917-19 (Vancouver: University of British Columbia Press, 2010). 299 pages. In From Victoria to Vladivostok Benjamin Isitt explores a virtually overlooked part of Canadian history – Canada’s military intervention in Siberia after the Russian Revolution of 1917. The result is a stimulating and important work that shines new light on multiple threads of Canada’s domestic and international Great War experience, presents a compelling exposé of the Allied intervention in Siberia, and forces a reconsideration of the relationship between working-class and military history. 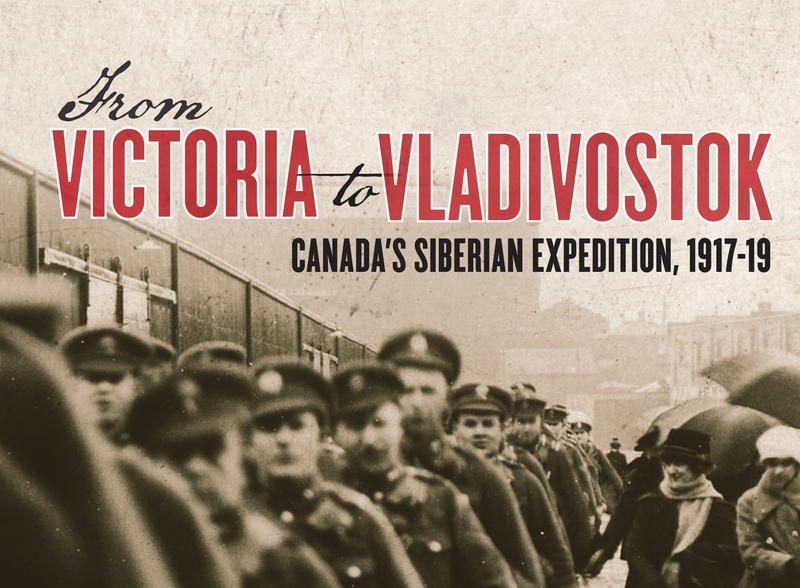 From Victoria to Vladivostok is divided into two parts which explore the events that led up to Canada’s intervention in Siberia and the history of Canada’s Siberian expedition. The weight of Isitt’s work lies in the book’s first part. It is here that he examines the factors that caused the Canadian government to decide to intervene in Russia in spite of considerable public opposition, and the impact this decision had on Canadian society. In doing so, Isitt deftly adds to a growing historiography questioning, if not directly undermining, the commonly held belief that anti-conscriptionism was the purview of Francophone Quebec, while concurrently highlighting the need for historians to consider the role of organised labour in shaping Canadians’ experiences and perceptions of the war, and how the Bolshevik Revolution influenced the development of labour/working-class consciousness in Canada. For example, Isitt argues that the little known mutiny of Francophone conscripts bound for Vladivostok was motivated as much by anti-interventionist and pro-Bolshevik propaganda spread by British Columbian labour groups as by any other factor. Likewise he compellingly demonstrates how the Canadian government’s decision to intervene in the conflict caused many members of Canada’s working-class to reconceptualise their relationship with their employers and the state and vice versa. The government’s decision inflamed a working-class already radicalised by the introduction of conscription and the tribulations of years of war. The Canadian working-class’s increasingly vocal support for the Bolshevik cause led Canadian elites to fear – with some foundation – a Bolshevik-inspired revolution in Canada. The result was an atmosphere of hostility, distrust, resentment, and repression, which finally exploded in 1919 in the form general strikes that swept across Canada like wildfire. Isitt’s sympathies for Canada’s working-class and his belief that Canada’s intervention was, at best, a mistake are apparent from the outset of the work. These positions inform both his analysis and conclusions. Such obvious partisanship is not in and of itself a ‘bad’ thing, however, on occasion his partiality does cause him to drawn conclusions that are open to question. For example, Isitt’s charge that Canada remained essentially a loyal lapdog to Britain during and after the Great War and that the Siberian Expedition revealed a “fundamental streak of subservience” in the Dominion government’s foreign policy is a problematic claim (p. 169). Not only does such a statement ignore events after the war when Canada refused to be drawn in to the quarrels of its imperial master, such as the Chanak Crisis of 1922, but also events during the Great War. Far from being submissive, the Canadian government and, indeed, military, increasingly asserted its autonomy from its imperial master as the war continued. In 1917 Canada and her sister dominions gained recognition of their right to have a voice in imperial war policy and foreign policy with the formation of the Imperial War Cabinet and in the resolutions of the Imperial War Conference. A year later Canada would refuse British demands both to reorganise the Canadian Corps into an army (a demand that would have significantly weakened the divisions that constituted the Corps), and – during the German Spring Offensive – that the Corps be divided up. In the same year the Canadian government asserted – in the face of strong British opposition – its right to directly control the Canadian Corps. To be sure, the British government retained ultimate control of imperial policy and the war effort, treating Canada and the other dominions as junior allies at best. Nevertheless, the actions of the Canadian government hardly suggest a subservient dominion, but rather one acting in what it perceived to be its best interests. Of course, what the government of Canada believed to be in the best interest of the dominion could, and often did, directly align with those of its imperial master. This is a more realistic appraisal of Canada’s motivation to intervene in Russia, rather than, as Isitt claims, it being a matter of “kowtow[ing] to Winston Churchill and the other British ‘hawks’.” (p. 169) Canada, as Isitt acknowledges in his introduction but seemingly dismisses in his conclusion, had many powerful economic, geopolitical, and ideological reasons for joining the Allied intervention in Russia. Siberia represented an untapped resource and consumer base for Canadian companies, while crushing the Bolsheviks – who not only had taken Russia out of the war, but also, amongst other factors, offered a worrying example to Canada’s working-classes – was a powerful and multilayered motivation in its own right. As Isitt notes, Prime Minister Borden pointed out to reticent colleagues that if Canada wished to be seen as a world player she had to act like one. The joint the Allied intervention in Russia offered the means to do so (p. 7, 95). In relation, Canada’s withdrawal from Russia in 1919 – despite Churchill and other British officials’ rebukes and pleas – further suggests a dominion prepared to act in its best interests, even when such actions brought it into conflict with its imperial master. These observations do not deny – as Isitt powerfully reveals – the very real concerns and hostilities that emanated from all levels of Canadian society throughout the campaign. They do, however, caution against the assertion that Canada obediently followed Britain in to Russia. From Victoria to Vladivostok includes 10 appendices and 37 images. The appendices are a valuable reference tool, covering a wide variety of material including: the composition of the Canadian Expeditionary Force (Siberia); troop and cargo movements between Canada and Vladivostok; and letters, declarations and proclamations regarding the intervention by a variety of different parties. The images, which encompass an assortment of subjects in Canada and Russia, also provide rich documentary evidence by offering the reader a virtual window looking into Canada’s military involvement in Siberia. From Victoria to Vladivostok forces one to deeply consider the events and issues discussed by Isitt. As such it is a highly recommendable work, not only because it offers new insight into a ‘forgotten’ chapter in the history of Canada, but also because it challenges its readers to re-evaluate many comfortable assumptions and ‘truths’ that commonly buttress public and academic memories of Canada’s involvement in the Great War.